Several areas of Bohol have been monitored for flooding as a result of the torrential rains since yesterday afternoon until late last night brought about by Tropical Depression “Domeng”. The Provincial Disaster Risk Reduction and Management Office (PDRRMO) sent teams to the towns to assess the effects of the heavy rains and wind that has just swept Bohol. The Philippine Atmospheric, Geophysical and Astronomical Services Administration (PAGASA) issued flood advisory yesterday, covering entire Visayas; and northern, eastern, and western Mindanao. The local PAGASA station had been informed of the tornado (buhawi) spotted in an area in barangay Dao. Heavy rains with lightning and strong winds due to thunderstorms affected Tagbilaran City and the towns of Calape, San Isidro, Catigbian, Loon, Antequera, Maribojoc, Balilihan, Sikatuna, Cortes, Corella, Alburquerque, Baclayon, Dauis, Panglao, Loboc, Loay, Sevilla, Trinidad, San Miguel, Danao, Dagohoy, Alicia, Pilar, Mabini, Candijay, Anda, Guindulman, Duero, Clarin, Tubigon and nearby areas. The first to experience the heavy rains were the towns of Trinidad, San Miguel, Danao, Dagohoy, Pilar, Sierra Bullones, Guindulman, and Duero. The PDRRMO sent teams to monitor reports on flash floods and landslides from the affected towns. The PDRRMO is still consolidating reports from the areas. Areas near Bohol were also affected by the heavy rains with lightning and strong winds due to thunderstorms such as Naga City, San Fernando, Aloguinsan, Minglanilla, Talisay City, Cebu City, Carcar City in Cebu province. The heavy rains in Cebu area persisted until dawn with lightning and strong winds, affecting Toledo City, Pinamungahan and nearby. As of 02:22 a.m. today, PAGASA terminated all thunderstorm advisory but still advised areas near the path of TD Domeng to continue monitoring for updates. PAGASA tracked that the tropical depression “has maintained its strength as it moves north-northwestward over the Philippine Sea”. Ruel Orion of the PAGASA local station said the tropical depression will not make landfall and will spare the lands. Orion, however, warned that another tropical depression might be developing. TD Domeng brought moderate to heavy rainfall in areas within its 300-kilometer diameter which included Central Visayas, Eastern Visayas, Caraga and Northern Mindanao. “Residents of these areas are alerted against possible flash floods and landslides and advised to coordinate with their local disaster risk reduction and management offices,”the PAGASA advised. PAGASA already estimated the TD Domeng is less likely to make landfall, but had triggered strong southwesterly surface windflow that will bring moderate to occasional heavy rains over MIMAROPA and Western Visayas beginning Thursday, and over the rest of the western section of Luzon beginning Friday. Heavy rains poured last night as the weather system was hovering over the area 670 km East of Guiuan, Eastern Samar. It maintained its strength with maximum sustained winds of 45 kph near the center and gustiness of up to 60 kph, moving North Northwest at 15 kph. PAGASA estimated that by tonight, the eye of “Domeng”would be at 580 km East of Catarman, Northern Samar. By Thursday evening, it would be in the area 575 km East of Casiguran, Aurora. By Friday evening, it would be 535 km East of Aparri, Cagayan. By Saturday evening, it would 600 km East Northeast of Basco, Batanes. PAGASA estimated that it would leave the Philippine Area of Responsibility by Sunday evening, around 1,185 km East Northeast of Basco, Batanes . 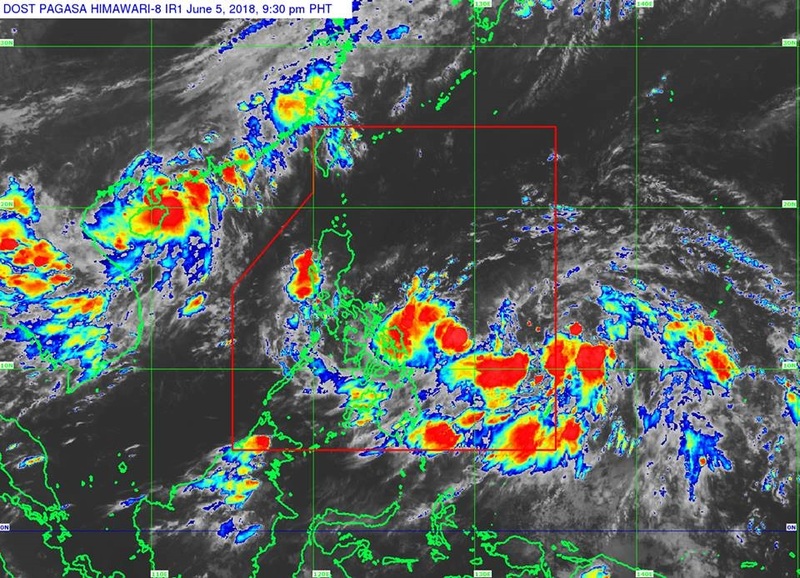 “Another Low Pressure Area (LPA) embedded in the Intertropical Convergence Zone (ITCZ) was estimated, based on all available data at 1,030 km East of Virac, Catanduanes,”according to PAGASA.